The Thermotronic III is a rheological tool to standardize varnish preparation and viscosity measurements in research and industry. 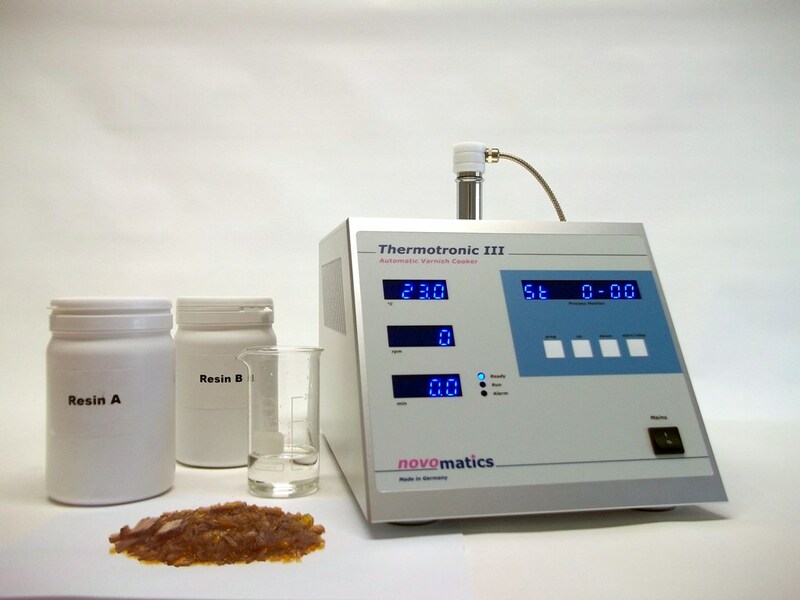 In order to produce varnishes of consistent structure and quality, Novomatics has developed an automatic device for quick and reproducible preparation of test-oil-based varnishes prior to the viscosity measurements. The objective was to eliminate the possibility of errors due to individual influences in the dissolving phase in order to improve the accuracy and reproducibility of viscosity measurements. Solvency and compatibility deviations have been minimized by the use of highly specific test oils. Accurate and reproducible viscosity measurements are vital to predict the end use performance of a printing ink. TheThermotronic III is the key to viscosity measurements of higher accuracy and reproducibility. The rheological properties of a varnish is based on the solubility of the resin in a specific test oil. Some resins show a poor solubility and require a more aromatic oil than the ones with a good solubility, which even can be dissolved in aromatic-free oils. Therefore, specific test oils must be used in order to be able to prepare varnishes of resins of different type and make. The Thermotronic III is a microprocessor-controlled varnish cooker, which makes the quality of the varnish independent of individual operator skills. Even high resin concentrations do not effect these results, due to the powerful stirring motor and the use of a magnetic stirring bar of high volume and weight. A special metal test tube with a round bottom is used in order to avoid residual material in the test tube. The filling weight of the test tube is 50 grams (1.8 oz). The material is heated up to a temperature level of 230 °C (450 °F) by a highly effective integrated air jet heating system and remains at this temperature level for 4 minutes during which the resin is completely dissolved in the test oil. The solution is then cooled down under controlled cooling and stirring conditions to 90 °C (194 °F). When this temperature level is reached, an audible and visible alarm is activated to indicate that the varnish is ready for use in the viscometer. The metal test tube can be removed from the Thermotronic III by means of a metal clamp. The varnish can cool down in the viscometer to the standard temperature level of 25 °C (77 °F). 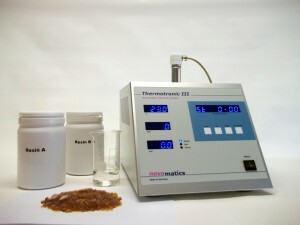 The Thermotronic III can be used to upgrade existing viscosity measurements. It has proven to provide a higher accuracy and a better reproducibility both in Laray- and in rotation viscometer applications. The Thermotronic III is recommended by the European working group for standardisation of ink test methods EUROCOMMIT as a preferred method for varnish preparation research and industry. Extensive round-robin tests have proven the reliability of this test method.